May 2016 Manila, Philippines ②　Chance Meeting at the Copacabana. As I reach the end of my rope with this taxi driver who refuses to accept my 500 pesos, the young hotel security guard points at the bills and mutters something. With that single utterance, I finally understand why the taxi driver has been complaining. I pull everything out of my wallet and ask, “Are you telling me that all of these bills are old money?” “Yes! That’s right. Everything you have there is old money!” answers the taxi driver, using the words “old money” for the first time. I’m relieved to know that at least my reservations are at a middle-class hotel. Any hotel of that grade should be able to exchange old currency. In Japan, an old bill would be met with an excited, “Cool!”, but maybe Japan is unique in that respect. So, at this moment, I find myself in Manila with not a peso to my name. Pretty much “up the creek without a paddle”. What a predicament to be in in a foreign country, in the middle of the night, in this situation. Still, I am in Manila, a major Asian city, and I am staying at an upper-end hotel popular with Japanese visitors, so I am positive that exchanging Japanese yen to Philippine pesos will not be a problem. “Now I understand what you were trying to say. I’m very sorry.” I feel that I must offer a sincere apology as a foreigner. Way back, I was at a small restaurant in the countryside, when I witnessed a foreigner become irate that “This is a restaurant. How can you not take credit cards?” I remember getting equally irate, “Hey, you’re in Japan now.” I am positive that whether verbally or mentally, any Japanese person would have said the same thing to that guy. This situation was no different. I have no idea whether I could stuff some old bills in my pockets, head to a bank the following day and get them exchanged, but lolling around all day in the hotel lobby waiting for the guy to return was not an option. Not wanting to reveal my doubts, I laugh, “I’ll go to the bank tomorrow. No problem.” I stave off his expectant demeanor, get out of the taxi, and head with my luggage toward the front desk. Fortunately, at the front desk is a woman who speaks fluent English. “I’d like to check in… But before that, could I exchange some Japanese yen?” I point to the taxi driver who is now standing with the security guard and explain, “I have to pay cab fare to Mr. Louis Armstrong over there.” She leans over the counter and looks toward the hotel entrance. With a look of “I see”, she turns to me and shows me the not-so-great exchange rate. Well, it is a hotel rate. What do I expect? On second thought, the rate is actually quite reasonable. I nod, “Okay,” and hand her 10,000 yen, upon which she immediately hands me Philippine pesos in small bills. “These bills okay?” I wave them jokingly at the driver as I walk toward the entrance. “Yes, those bills are okay. Sheesh… It’s about time I get paid,” he sighs to the security guard as he smiles. I bet that is the kind of smile Louis Armstrong gave after performances, his trumpet in one hand, while being showered in applause. I hand the taxi driver 200 pesos for the 170 peso fare. I have already factored in the, “Sir, can’t you spare a little more? I have waited a while after all.” “Don’t think that all Japanese are rich. I’m a poor Japanese. Remember that. In Japan there are rich people and poor people. I’m the latter. Understand?” That is line I use when I want to avoid haggling during my trips. However, to compensate him for his time, I add the 20 pesos left over from the currency exchange for a total of 50 pesos in tip. He smiles wryly and says, “Thank you,” as I head back into the hotel. I am not sure whether he is acquaintances with the security guard, or whether they simply hit it off. I have the feeling it is the latter, but either way, they continue chatting jovially for a while. At the front desk I sign the deposit and finish checking in. As I head toward my room, I turn around, but Armstrong and the taxi have disappeared. No applause begging for an encore from his trumpet can be heard, of course. In fact, other than the strange sound emitted from the air conditioner, the only sound that fills the lobby is late night silence. The Copacabana is a steel-framed concrete-construct resort hotel. When I first saw a picture of it on the travel site, it appeared to be a picture taken in the 1970s. I read more about the hotel, I found that it was built in 1974, the same year I was born, and that ended up being the determining factor in choosing this hotel. It was not until my interest in building facades from Japan’s Showa period strangely expanded to “not-quite” old buildings, furniture and cars found in Asia and abroad, that I discovered my proclivity toward such things. Old, frankly plain-old, steel-construct American-style buildings that you might see in a ‘70s movie, also happen to fall in my strike-zone. To me, the tropical heat and lack of decorative luster actually provides this building with quite a bit of character. The inorganic concrete walls create a similar atmosphere to the Four Paddle Condominiums in Wikiki where my friend used to live, and as I walked down the hall from the elevator, I feel like I have arrived in Oahu in the evening for a visit. Immediately upon entering my room, I turn the air conditioner on full-blast and look at the cityscape through the rather small window. In the distance I can see the twinkling lights of Manilla’s downtown buildings. 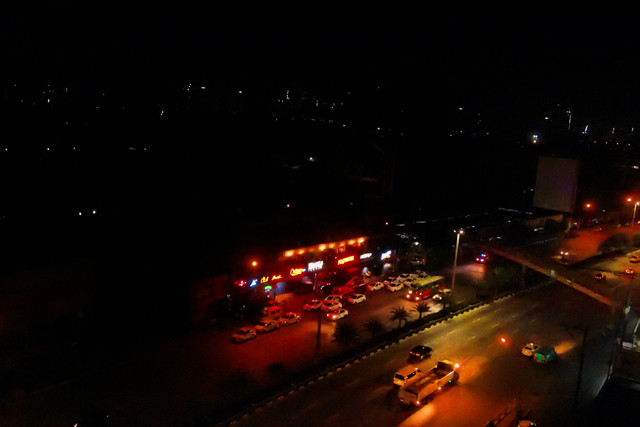 Below, to the right, are neon lights of the famous “Edsa Complex” that houses go-go bars and nightclubs, and in front are lined-up a dozen or so taxis. Directly below is a street that has 6 lanes for each direction, and a considerable amount of traffic despite it being so late at night. I settle my things, wash my face, turn down the rattling air conditioner, and leave the room. I cannot wait to have a beer. I have already checked that there is an American-style restaurant on the street behind the hotel that stays open until late. I know that it is open late because I looked it up already. It couldn’t be closed… is what I what I say to myself as doubts begin to cross my mind about when that information was last updated. The multiple times I have made the same mistake on past trips begin playing back in my brain. I look at my cel phone and see that it is about to turn midnight. I walk a little further and try to make out the corner where the restaurant should be, but I do not see the lights of the restaurant sign or any light falling from the windows onto the sidewalk in front. I wonder whether I should go all the way to the restaurant to make sure, but the way that young man had said, “If you think I’m lying, then go see for yourself” makes it hard to believe he is lying. I consider whether I should let him give me a ride to a restaurant that is a little further out, but predict that that ride will be followed by, “How about going somewhere fun next?” “I know a bar where there are pretty, young girls.” And so on, and so on. The possibility of such an annoying train of events and the possible related risks the acceptance of a ride might entail stop me in my tracks. The young man immediately begins fast-talking. Hoping to shake him, I say in an excessively downtrodden way, “Oh, well. I guess I will just have a drink at the hotel and go to sleep,” and turn back toward the hotel hoping to shake him. Further down the road on the other side of the street I can see the lights on at Jollibee, an American-style fast food restaurant exceedingly popular in Manila. That place, I recall, does not serve alcohol… and crossing 6 lanes of traffic going one way, then crossing 6 more lanes of traffic going the other way, to settle for some unappetizing cola and a sack of chicken, is no doubt a complete waste of time. I might as well stop for some snacks at the liquor store next to the hotel and drink as much as I want in front of the TV in my room. As I am having this conversation with myself, the pedicab is still following me. I continue my exaggerated display of disappointment back to the hotel. “Really, I don’t need a ride. I am tired. I am just going to have a drink in my hotel room and go to sleep,” and with those words, he puts on an expression of disappointment and finally pedals away looking for other fare. At the liquor store I buy two kinds of beer, a large bottle of mineral water and some random snacks, and head back to my hotel room. By now it is well into the night, and somewhere along the way I seem to have lost my appetite. I shower, turn on the TV, and open up my laptop. As I work, I drink the beer and munch on the strange snacks that turn out to be not half-bad. They taste “American”. As I finish the larger can of beer, drowsiness sets in. I open up the regular sized can and sip it, scroll Manilla on Google Maps and download it to my iPhone so I can see it offline. That way, even when I have no internet service, my GPS should be able to show me where I am on the map. I have already finished about a week’s worth of work before leaving Japan, so even though the Philippines is so close, I feel that after a five hour flight, at 2:00 in the morning, I can just fall asleep. I dive into bed and open up my computer. “Tomorrow, I think I’ll just lie out by the pool until check-out.” It is early June. Being half naked under the sun is something I will not be able to do for another couple of months in Japan, but in Manilla the climate is roughly that of Japan in August. It is like having a “pre-summer pass”. No sense in letting it go to waste. 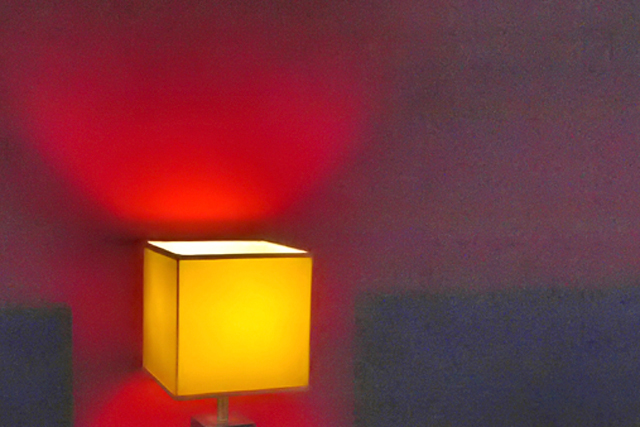 As the red walls in the dimly lit room subdue me, the melody that plays in my head is not “Copacabana”. That song does not quite fit the leisurely image of these tropical isles. What flows instead is the rendition by Robi Kahakalau, a Hawaiian singer, of some old song called “Blue Bayou”. “Wait, this is neither Brazil nor Hawaii. This is… Manila.” No sooner have I muttered this to myself in English, when my eyelids give into gravity, and the red of the walls slowly fades to black. 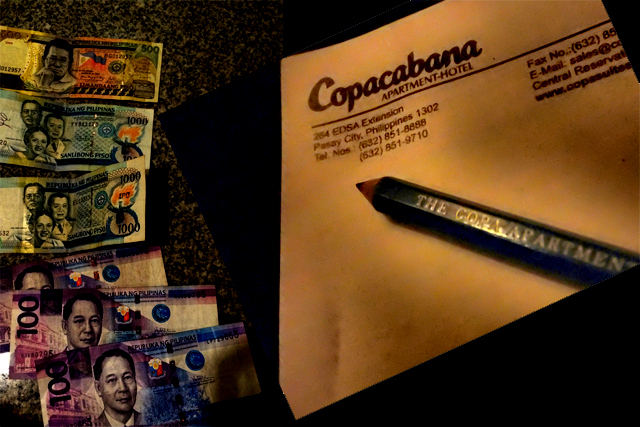 Manila, Philippines ① Scary Airport, A Legendary Trumpeter & One 500 Peso Bill. Spring Introduction to Reading Japanese Sake Labels. April 2011. Post-disaster Memories (21 Days).